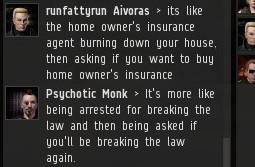 Previously, on MinerBumping... After a miner's alt was blown up in Mitsolen, he convoed me to demand that Agents notify miners before they get blown up. I listened patiently to his concerns. 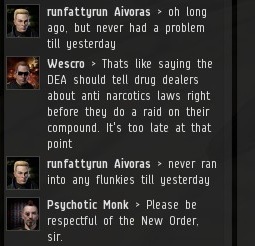 To help put runfattyrun Aivoras' mind at ease, I invited some representatives of the highsec community into the convo. Wescro had it right--everyone has been asked to purchase a mining permit. If I need to ask twice, then everyone can just read the Code twice. CSM candidate Psychotic Monk dropped by to offer his potential future constituent some advice from a fair, neutral point of view. A consensus was reached quickly: A miner cannot claim innocence through ignorance. 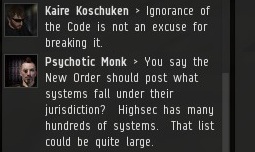 If anything, ignorance of the Code is another violation of it. Psychotic made an important point. 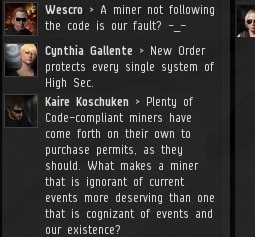 A highsec miner's lack of awareness of the Code and the New Order is a symptom of bot-aspirancy. 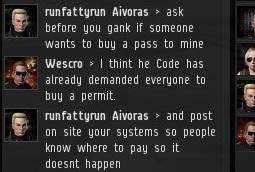 runfattyrun admitted in front of the Agents that he was already familiar with the Code before being attacked. 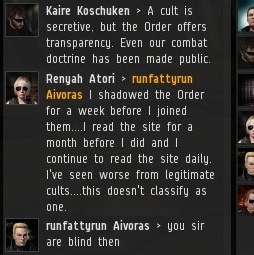 In desperation, runfattyrun questioned the legitimacy of the New Order family. 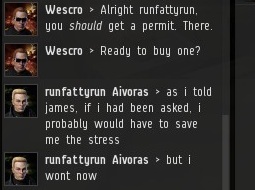 Carebear logic: I would have bought a permit, but now that I've seen the consequences of not having one, I'm less likely to get one. Whaaaat? runfattyrun confessed to his bot-aspirant desires and left the convo. I am a man of extraordinary compassion and empathy. I understand that sometimes people just want to relax or watch a movie. However, I am also a man of logic and reason. 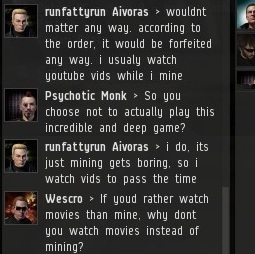 At the end of the day, I have no problem with people who want to do things other than play EVE--I just don't think they should get paid spacemoney for it. To assume that miner bumping or any affiliates are known by all members of the community is asinine. If anything, someone who is part of the community would know how diverse or widespread EVE can be. I've played on and off since 2006 and didn't know a dam thing about miner bumping or the "Code" until You Tube cookie magic threw in in my face. To assume that a player is a bot because a player is unfamiliar with your antics is laughable. I don't think anyone has said a person is a bot if they don't know about us. But they are afk and or inattentive and not involved in the game if they haven't heard about us. Not to mention, they have to be inattentive to get ganked in the first place. All those are signs of bot aspirancy, which is also against the Code. Mind you that has nothing to do with this case, runfattyrun admits to knowing about us and not being courted or whatever. In the above image, Psychotic Monk most definitely says that and then is reinforced by James statement below the image. I was happily ignorant to this role playing racket for years...and never AFK(unless to drop a deuce) or botting. "In the above image, Psychotic Monk most definitely says that"
He most definitely does not. That is a bald-faced lie on your part. He basically says that someone who doesn't know about the New Order displays a certain quality of uninvolvedness, which is almost similar to a quality that bots possess. That is an incredibly vague statement. I challenge you to name anything in this world which doesn't possess a quality, which I could name, which would be almost similar to a quality which I possess. Go ahead, what are you waiting for? 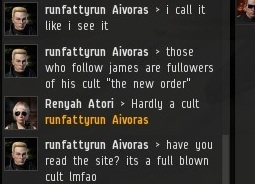 "The New Order is quite extensively talked about....If someone has somehow missed them, then they are entirely uninvolved in the game..."
Now that the statement I question is easier for you to see, my point is that not knowing who James is or the antics of miner bumping does not mean you are a bot. To say I or other players that are unaware of these actions or antics is a sign of bot aspiration is insane. That or your egos are bigger than your reputation. I understand your quality statement. It holds true in everything. Perspective is a powerful tool. Psy Monk does say that it's similar to a quality that bots possess. That is a vague statement, but it doesn't nullify or exempt the previous statement.
" To say I or other players that are unaware of these actions or antics is a sign of bot aspiration is insane. " Actually, to refer to yourself as unaware of the New Order, when you are posting comments on the minerbumping blog, is insane. ""The New Order is quite extensively talked about....If someone has somehow missed them, then they are entirely uninvolved in the game..."
Now that the statement I question is easier for you to see, my point is that not knowing who James is or the antics of miner bumping does not mean you are a bot." That's an irrelevant point, bots are not mentioned in the sentence you are putatively responding to there. Your point is devoid of sense or reason, as are you. read my first post. I have stayed true to it, as it was my soul argument. Cool off on the Cult kool-aid and try to use the qualities or perspective you recently preached. There are different perspectives than your own. Dam captcha. leave me alone! "soul argument"?? where are you from? Ok, let's look at your first post: "To assume that miner bumping or any affiliates are known by all members of the community is asinine." Assume that it's known by all members of the community? they're discussing properties of members who don't know about them, therefore obviously they can't be assuming that all members do know about them. There are obviously many perspectives other than my own: your perspective is logically self-contradictory and therefore without value. Sorry, duder. "To assume that a player is a bot because a player is unfamiliar with your antics is laughable." No one did this either. Your first post is a bizarre fantasy, relevant to nothing, worth nothing. Staying true to your first post was your second mistake: writing it was your first. That's a good point, I could have used that angle too, since he was using a lot of insults. "insane", "asinine" etc. Didn't really need to though, sticking with the logical response, one angle at a time. You seem to have fallen into the trap of taking things literally. Lighten up and grow a humor gland. my belief is that the new order ganks afk miners because they are jealous of their ability to perform multiple tasks at once. So...your belief is that afk miners are MORE capable than gankers are, and that therefore ganking should be made not just 100% easier as James has proposed, but MUCH MUCH easier.... like 400-500% easier. Ok, you win, deal. yes they should remove CONCORD from the game... is exactly what i'm trying to say. That would definitely be the end of afk mining.